As I mentioned in the last post, we are anticipating leaving Vermont soon. A cold front swept through on Wednesday and with that swift stroke, summer has ended. We are now wearing sweatshirts and long pants, and running the furnace in the Airstream at night when the temperature drops into the 40s. A few early red leaves have dropped into the gravel driveway around us, and the Champlain Valley Fair starts this weekend. All the signs are there for the coming of Fall. With the various problems we’ve encountered over the years while traveling, I’ve learned to do a pre-trip equipment inspection well in advance of departure. Checking the gear the day you plan to leave just means that any problems you find will automatically delay your trip. So last night I did a sweep of the Airstream exterior, and sure enough, I found this on the Hensley hitch. 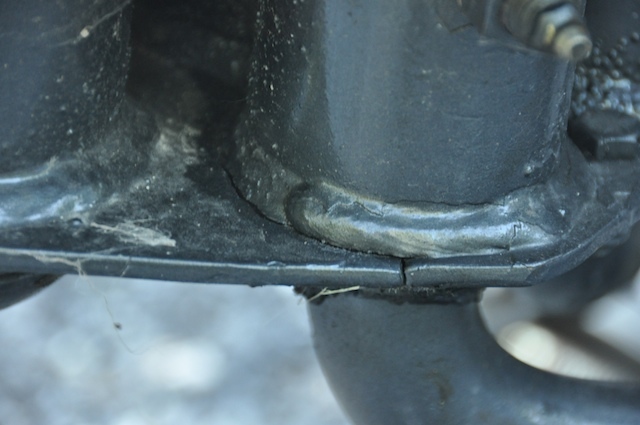 That’s a crack in the lower part of the main hitch assembly, where the weight transfer bar (“spring bar”) enters the hitch head. 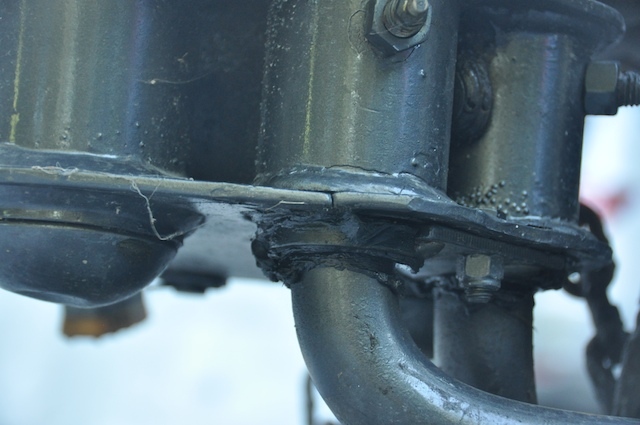 There’s a crack clean through the base plate and then extending about 1/4 around the weld. The crack goes all the way through to the bottom. This is a high-stress area of the hitch. The load imposed by the weight transfer bar puts a lot of stress at this point. The Hensley is extremely sturdy, but nothing made of metal is unbreakable. This hitch has about 70,000 miles on it, and I haven’t babied it. The good news is that I spotted it several days before we had planned to leave. The other good news is that it can be repaired locally by a welder, or through a free exchange under Hensley’s lifetime original owner warranty. I called Hensley today and we agreed that even though a local repair would be quicker, I might as well get a refurbished hitch head under the warranty. I will pay the shipping costs both ways, which will cost about $165. The replacement hitch will arrive on Wednesday. This will delay our departure by a couple of days, but not seriously impact our plans. The lesson here is that it pays to inspect everything a week or so before you plan to take off. It could have been anything on the Airstream or the tow vehicle. When I think of all the things that have gone wrong on us in the past (tires, wheel studs, hitch, brakes, electrical ground, receiver, battery, etc.) I can see how a good safety inspection is required before each and every trip. You’ll see a bit of emphasis on safety issues in upcoming issues of Airstream Life magazine. I am working with three different authors at present, to develop well-researched articles on towing issues, hitch inspection, and checklists. Airstream reports that nearly 1/3 of new Airstream trailers are being bought by people who have never owned any type of RV before. That means there a lot of people out there thirsting for reliable information on what they should do. A tremendous amount of misinformation is floating around on the Internet, so I feel it’s an obligation of publications in the industry to do some “myth-busting” and help prepare newbie owners to travel safely. As this episode demonstrates, one of the most effective tools that anyone can use is a pair of open eyes. Our summer has reversed itself lately. We arrived in Vermont with a full agenda of events and responsibilities, and now that they are done, we are in a lazy phase. The weather has reversed too, from the cool and rainy days of July to an uncharacteristically hot August, and warm nights full of damp air, so that the dominant sound has changed from chirping birds and waves on the beach to the droning of fans stirring sluggish air. This is exactly backwards. Normally July is hot and humid and August is a gradual slide into dry cool fall weather, but this year Mother Nature has decided to do things a little differently, which has confused everyone. Emma is in bed late this morning, propped up on pillows with a thick book. She doesn’t seem inclined to get up and enter the world, probably because there is little to look forward to today. We are expecting a Sunday of little activity, and morning is damp and warm again, presaging a cloudy and sultry day. Yesterday I coaxed her out of bed by making waffles, which probably set a bad precedent for future mornings. But she is on summer vacation, visiting her grandparents, and we tend to cut her a lot of slack during the summer so she can be a kid. When there aren’t other kids visiting us here at the lake, she spends her days painting watercolors, reading books about dragons and talking cats, playing on her Nintendo DS, splashing in the lake, and taking in the occasional SpongeBob episode. I think this looks like a waste of youth to many older people, but I remember summers spent in similar unproductive activities, too. I suppose it can’t all be hikes, homeschooling, and karate lessons. We’ll be back to that stuff soon enough anyway. Alex and Charon came back the Vintage Trailer Jam with us, and together we spent a couple of quiet days recuperating from the intensity of the Jam. They were content to simply rest on the deck with a book, or snooze on the couch, which helped Eleanor and I force ourselves to relax as well. I’m in between issues of the magazine, so I have a couple of weeks of lighter workload before I have to kick editorial work on the Winter 2009 issue into high gear. When we were full-timing we’d take this opportunity to disappear into a national park for a few days (where cell phones and Internet usually didn’t exist), but since we are here in Vermont we’ve just been reading and hanging out with local friends. So now entire Caravel is in Michigan, and I have hope that it will be completed by mid-winter. It really doesn’t need much, other than re-building of the overhead cabinets, drawers, and installation of the interior furniture that I built last summer. Ken, being a perennially hard worker and a strong believer in shiny aluminum trailers, has spent the last several Saturdays polishing the exterior — a bonus I hadn’t asked for. If the trailer is complete and roadworthy by mid-winter, I may go up to Grand Rapids and fetch it back to Arizona. Our main Airstream has been getting shuffled around a little too. We discovered in Saratoga Springs that the refrigerator was not cooling properly when it was running on gas (but worked fine on electric). This is very strange because these adsorption-type refrigerators use a single cooling unit. The unit relies on about 200 watts of heat to function, which can be provided by a small electric heater or a gas flame. We suspected a blockage due to spiders but Alex and I disassembled the unit and found nothing suspicious. We blew the chimney clean with compressed air but this didn’t help (although a bit of something charred, like a fried ant, did fall out). With home solutions not helping, we were forced to hitch up and tow it into South Burlington to see the local competent RV repair shop. They could not find an overt problem either, but the flame seemed a little low to their appliance expert. A tech disassembled the burner elements and cleaned them. Like us, he found only a tiny bit of soot or burnt material. Still, this seemed to solve the problem. We ran the fridge on gas for several hours and it now appears to be functioning normally. I’ve backed the Airstream into its tricky spot in the driveway for the third time, and now we seem to be done with tasks and obligations. All of the local friends have visited, and we’ve had dinner on the deck a dozen times. We’ve ridden in the Glastron, sailed the Buccaneer, skiied behind the Whaler, and burned huge piles of driftwood on the beach. Last night was another party on the beach Tiki Bar with half a dozen of the regulars who always come, and it was fun, but it also felt like possibly the last Tiki party of the summer. This late summer weather can’t last, not up here near the Canadian border. In a couple of weeks days in the 80s will be a memory and the first cool breezes and early sunsets will start to warn of an approaching fall. Soon the leaves will start to show color, but by then the boats will be put away and no one will be thinking of wakeboarding or waterskiing. This means it’s time for us to start planning our trip back to Arizona. Even though we have weeks of decent weather yet to come in Vermont, I’d like to get rolling soon. We have a very loose plan in mind that brings us through about a dozen National Park sites, and Google Maps suggests that our route will be 3,841 miles, not including side trips. This will take two months for sure. Of course, the plan is highly subject to change depending on weather, fuel prices, and interesting things we find along the way. We’re going to use the usual method: pick a couple of “must-do” stops and have a rough timeline in mind, and a few short-term destinations, then let the rest of the trip develop as we go. We also have vague plans for Arizona. I’d like to get back in that wonderful period between low desert air-conditioning and the end of high-altitude camping. That means mid-October. But if we are having fun on the road, we can forgo the option to tent-camping at 6,000 feet in the Chiricahua or the Santa Catalina mountains. There’s also the likelihood that business obligations will force us to shorten the trip back, so that I can concentrate on new projects in the fall and winter without the pleasant distraction of full-time travel. With all these considerations in mind, we can only take indirect aim at our travel plan. The only thing that is certain is that summer is ending, and we must start our annual migration once again. 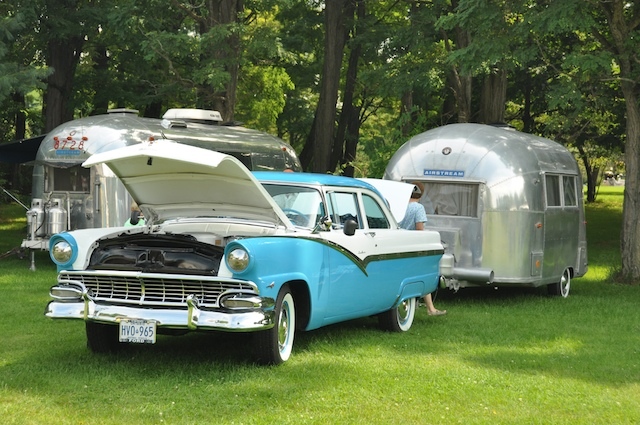 So what was it like at the Vintage Trailer Jam this week? Yep, hot and humid. We moved the dates from July to August in the hope of escaping the sweaty weather we experienced last year, but it didn’t help. This has been the hottest week of the summer. But that hasn’t stopped everyone from having a really great time. I wish I was one of the participants of this event, instead of a sponsor/organizer. It’s the participants who have the most fun. In contrast, the past two days have been a frenzied time for the organizers and volunteers. We seem to be constantly troubleshooting problems, and dealing with either setting up or tearing down for the events of the day. With parking, registration, seminars, electrical and water connections, troubleshooting, answering questions, giving away door prizes, and even making popcorn, there’s little time to enjoy the really cool collection of trailers we have on site. And we do have some very interesting rigs here. I’ll post an online album later. 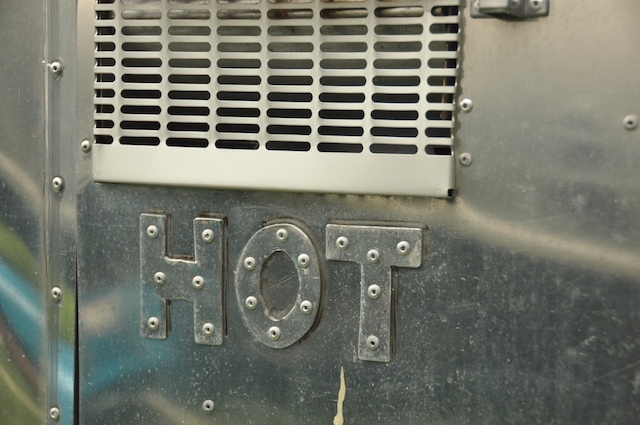 We have some rare trailers, including a Winnebago, two Frolics, a KomPac boat camper, plus some more common (but still cool) campers like a fiberglass Trillium, a couple of Shastas, two Serro Scottys, and a bunch of other unusual “canned ham” trailers. 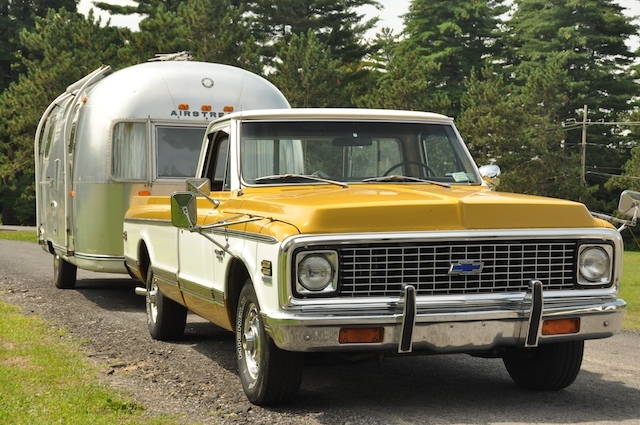 That’s in addition to the many Airstreams, including three Airstream 345 motorhomes, and a GMC motorhome. The seminars have been a big hit. I presented twice, on “Camping in National Parks,” and “Boondocking & Courtesy Parking.” Both drew some sizeable and appreciative crowds. Eleanor presented today on the subject of “Tools and Ingredients For Your Trailer Kitchen,” and she was marvelous. 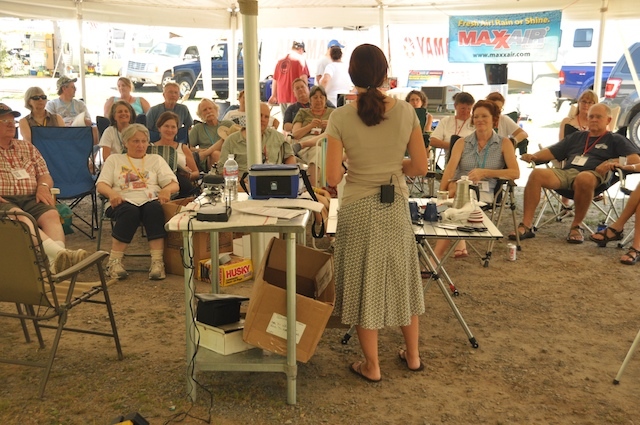 We also did a short joint seminar on “Backing Up Your Trailer Without Getting Divorced,” which was a lot of fun. Colin has also been presenting seminars on restoration topics, while Brett contributed a seminar on vintage motorhomes and co-presented with Colin on the subject of riveting. Other friends have pitched in with seminars, too. Vic Smith gave a polishing demo this morning, and our friends Charon and Alex talked brilliantly about “Working and Living On The Road.” They’ve all been winners, so I’m really pleased with the quality of content we’ve been able to offer this year. We’ve also had fun alternatives, like the bike ride I led today past six of the park’s springs. The big thing I like about the event is its diversity. Not only do we have a lot of different trailers, but we have a lot of different people. Every age from toddler to (nearly) geriatric is represented. We have 15 kids here this year, and they’ve been out playing soccer and riding bicycles all day. Some participants come from buttoned-down backgrounds, and others live a somewhat more casual lifestyle. Charon has even been able to do a little tattoo work here. 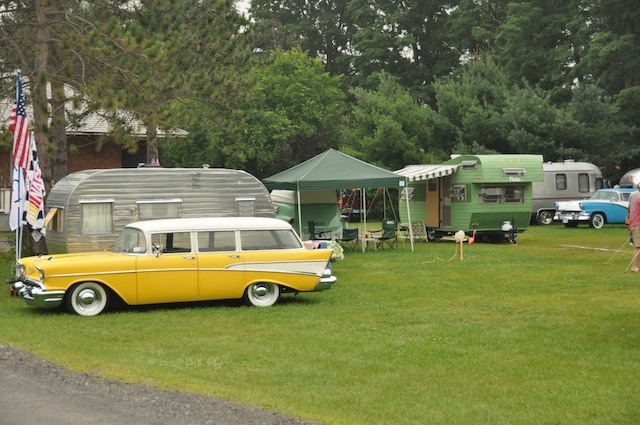 The Trailer Jam is a melting pot of people and lifestyles brought together by a common love of vintage trailers. Since the Jam is a day longer than last year, I have been careful to pace myself and not face the burnout that happened last year. The workload has been high but by planning carefully (and avoiding the temptation to stay up too late), I’ve been able to carve out an hour or so each day for work or private time with Eleanor. On Thursday morning we were even able to sneak in 90 minutes to go into downtown Saratoga Springs for a leisurely coffee/tea and pastry breakfast at Mrs. London’s. That won’t be happening again, but wow, did it feel nice to stretch out and relax for a little while, just the two of us. The one big bug of the week has been that our refrigerator is acting glitchy. We have been operating it on electric power for over a month, and when we switched to propane during our first 36 hours here, it stopped cooling. We didn’t realize this until the wireless thermostat reported 55 degrees inside, and by then the freezer had defrosted. We’ve since switched it back to electric, and made an appointment for next Thursday at an RV service center. The good news is that since the fridge still cools, so the expensive part of it still works. The frustrating news is that this refrigerator is only 13 months old. I have not been impressed with the quality of RV refrigerators made in the past decade. I’m surrounded by trailers with refrigerators made 40 to 50 years ago, all of which work perfectly and yet very few modern ones seem to survive even eight years. Tomorrow is the biggest day of all, with the vintage parts flea market, Open House, kids’ program (run by Eleanor), evening entertainment, barbecue dinner and the “big” door prizes. So we’ve got a lot to look forward to, before we strike the set on Sunday morning. It’s amazing the impact something like a wedding has on things, even after it is over. Eleanor spent a week recovering from her massive one-woman catering effort, I spent hours sorting photos and burning DVDs for people, and there were random days of cleanup and other tasks sprinkled in as well. Steve and Carolyn took a very interesting trip down Lake Champlain in their little Boston Whaler, all the way through the locks and canals to Troy NY, and then back. This took four days and struck me as the kind of honeymoon I’d like, because unusual trips interest me. Then they came back to base and sorted through the wedding garbage, looking for recyclables. Somewhat anti-climactic, but typical of them: right back at the hard work, persistently motivated. It’s not every new married couple that starts off their new life with a hunt through maggot-covered trash. Last Thursday Brett flew in from Florida and we retrieved his motorhome from Colin’s shop in Plattsburgh. Friday we visited the WBCCI Region 1 Rally up at the Champlain Valley Fairgrounds in Essex Jct VT. I was the after-dinner entertainment, speaking about “Camping in National Parks,” which was well-received by a crowd of about 70 people. We ran a little contest as I talked and showed slides of some of the 130+ national parks we’ve visited. The people who could identify the most parks in the slides won prizes, like Airstream Life t-shirts. I’ll be presenting the same talk this week at the Vintage Trailer Jam, in Saratoga Springs NY. We arrived here on Tuesday, and by then Brett, Colin, and a couple of others had already set up. Tuesday was “early bird” arrival day, with about 8 trailers ultimately showing up. Yesterday was the arrival day for the all other registrants, and we saw about 30 more trailers pull in. Today we are expecting another 25 or so, plus on-site registrations. It looks like we are in for a great week. The weather has been humid and warm, but thankfully mostly sunny and mostly we’ve avoided the thunderstorms. The trailers and tow vehicles coming in are very cool to see. I would guess that about 60% of them are repeats from last year, and that means plenty of new people and trailers to check out. We’ve got really cool door prizes to give away every day, including items from Thetford, Worthington (aluminum propane tanks! ), a Cyclo polisher, a complete set of Airstream Life back issues, and tons of other items. This year Eleanor is joining the panel of invited speakers. She will be co-presenting a short seminar about “Backing up your trailer without getting divorced,” with me today. On Friday she will give a talk on how to set up your traveling kitchen to do anything you want, and on Saturday she’s giving a kids program about bats, where the kids will all get to make bat t-shirts. We’re expecting 15 kids this year, which is really great. Emma will come down on Friday with Steve and Carolyn to join us.